Stamford Talk: Eat, Think, Drive, Blog! : SUPER!!! Stop and Shop for iPods! 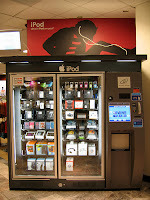 SCOOP: The Super Stop and Shop on Summer NOW HAS A MACHINE THAT DISPENSES IPODS AND EXPENSIVE HEADPHONES. MY TAKE: Well. Wow. I had planned on praising SSS for its cheap flowers, but this breaking news takes precedence: RATHER THAN A CANDY/JUNK FOOD MACHINE WHEN YOU ENTER, THERE IS A MACHINE WITH ROWS OF IPODS AND BANG AND OLUFSSON EARPHONES. It's to the right, behind you, so I didn't even see it. My techie husband called me over. My eyes couldn't process all the shiny stuff in boxes. I was still trying to make sense of the mish-mosh when he dragged me to the cookie aisle. d) ask whose idea that was. Part of me thinks, who is gonna buy that? But another part of me thinks, those B and O are the same over-the-ear, life-changing, 160 $ headphones my husband loaned me. They were the only pair that didn't ruin my workout by sliding off when I did weights. We lost them in our move. Now there they are, at Stop and Shop. VERDICT: Maybe SSS shoppers will buy expensive electronics with their groceries.